Hatters chief executive Gary Sweet is confident that Town’s planning application for a Park mixed use scheme at Newlands Park will go in front of Luton Borough Council’s development control committee next month. The club had originally been given a date of this evening for the proposals, a fortnight after a new stadium at Power Court was given the green light. However, with Luton searching for a new manager and the transfer window shutting tomorrow at 11pm, they requested a short delay to the hearing which was accepted. Speaking to Talksport this afternoon, Sweet said: “We now know that the Secretary of State isn’t going to call that in (Power Court), so that’s fantastic news. “The other scheme for a mixed use development on the edge of the motorway is important as that contributes financially to the development of the stadium. On the pitch, the Hatters have given themselves a real chance of promotion to the Championship this term, after beating rivals Portsmouth 3-2 in a thrilling contest at Kenilworth Road last night. Sweet admitted that Town’s current position at the summit has meant the board are looking at the possibilities of what going up to the second tier of English football would mean financially. He continued: “The only reason why we’re talking about it is just from the contingency point of view, looking at the business planning of it as it’s a big, big jump from League One to the Championship and we need to be prepared. “But we don’t get heady here, our feet are firmly on the ground. “We’ve got Shrewsbury on Saturday that as far as we’re looking, but we’re confident. 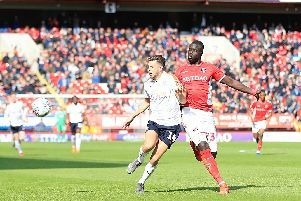 Sweet was in attendance as James Collins’ double and George Moncur’s late free kick saw Luton defeat Pompey in midweek, and felt he had witnessed one of the best performances for a decade. He added: “It was a fantastic game, people were coming out saying that was 90 minutes of entertainment, they can’t remember the last time they were entertained so much. “Two brilliant football sides and we had certainly the best of the first half, we played the best 45 minutes that we’ve seen this season, probably in the last 10 years I’d say since we’ve been here.